Windsor, 9 September 2008 – Haulfryn Group, the residential and holiday park specialist, has today announced that it will take full responsibility for the management and development of Willow Tree Farm Residential Park in Hythe, Kent. The agreement with the owner, John Cooper, includes the development of 85 new homes. Willow Tree Farm is on the outskirts of the seaside town of Hythe, with easy access to the M20 and the Channel Ports. The larger towns of Folkestone, Ashford, Maidstone, Canterbury and Hastings are within easy reach. The new development will feature new homes from the Omar, Homeseeker and Stately ranges and come fully furnished with full gas central heating and double glazing. A luxury two bedroom ensuite home with lounge, dining room, fully fitted kitchen and garage will cost from £185,000. All new homes come with a 10 Year Gold Shield Warranty. Haulfryn has a reputation built on high quality products and services and is justifiably proud that it employs over 200 local people across its locations. This latest agreement is part of the company’s strategy to grow its market share and to continue the Haulfryn tradition of offering top quality products and services to existing and new customers in 2008 and beyond. 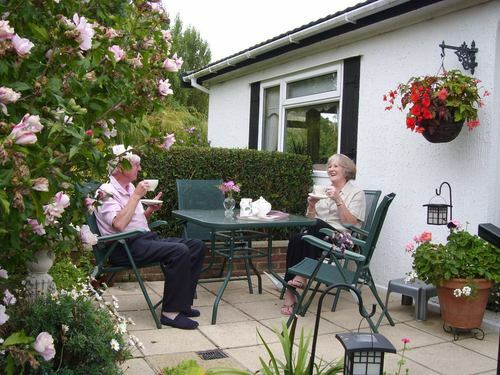 The Haulfryn Group, (www.haulfryn.co.uk) one of the largest holiday park operators in the UK, is a 72-year old family owned company renowned for the quality and style of its holiday homes. The company runs 21 holiday locations in some of the most desirable parts of Britain, with 11 in North Wales and 10 in the South of England. Haulfryn also owns and operates a further 30 residential parks in England. The company’s holiday homes range from luxury lodges to contemporary homes with prices to suit. All homes are built for easy maintenance, to the highest specification and many are exclusively designed for Haulfryn. A variety of finishes are available, from timber cladding to the latest in contemporary finishes. This press release was distributed by ResponseSource Press Release Wire on behalf of Ascendant Communications in the following categories: Men's Interest, Leisure & Hobbies, Home & Garden, Women's Interest & Beauty, Environment & Nature, Personal Finance, Business & Finance, Construction & Property, for more information visit https://pressreleasewire.responsesource.com/about.